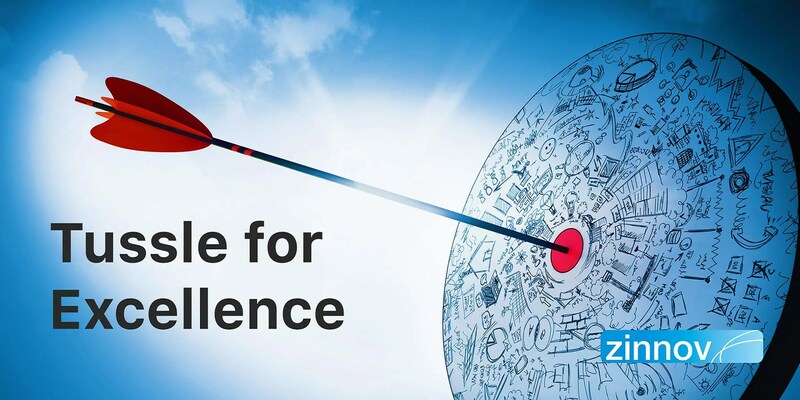 What Is Center Of Excellence (CoE) And Why Should Organizations Set It Up? What is Excellence? A strive to surpass ordinary standards tempered by the clarity of vision. On August 2, 1939, Albert Einstein wrote to President Franklin D. Roosevelt to alert him about the possibility that Germans might be building an atomic bomb and Hitler wouldn’t be hesitant in resorting to such a weapon. Roosevelt commissioned a secret research and engineering project for atomic weapons development, code-named the Manhattan Project. A team of experts from across the globe was brought together for this project, and as a result, on August 6th, 1945, the world witnessed the detonation of the first atomic bomb on Hiroshima in Japan. The loss of life and the destruction was catastrophic, but this incident led to the end of one of the deadliest conflicts of human existence – the World War II and established a new world order. The Allies had an edge over the Germans with their advances in technology. The German research & development was scattered and lacked capacity as compared to the scale of the Manhattan Project and other technology development centers that the Allies had set up. What the Allies achieved with the Manhattan Project, was an epitome of excellence and collaboration. More than anything, it was this project that helped them win the race for the bomb. This significant chapter from history redefined excellence. Even though times have changed, a race is still on. The race for being the best in industry, the race for being better than the rest. But, what are companies doing differently to ensure that they emerge as winners? The Manhattan Project brought together experts from different corners of the world. Six thousand scientists, physicists, and engineers from renowned universities and research labs came under one roof and made history. Similarly, to stand out and surpass competitors in the race, companies need to understand that expertise is the key, and Centers of Excellence are instrumental in accelerating companies in their journey to win customers and showcase a deep understanding of a domain. However, CoEs mean different things to different organizations per their business needs. 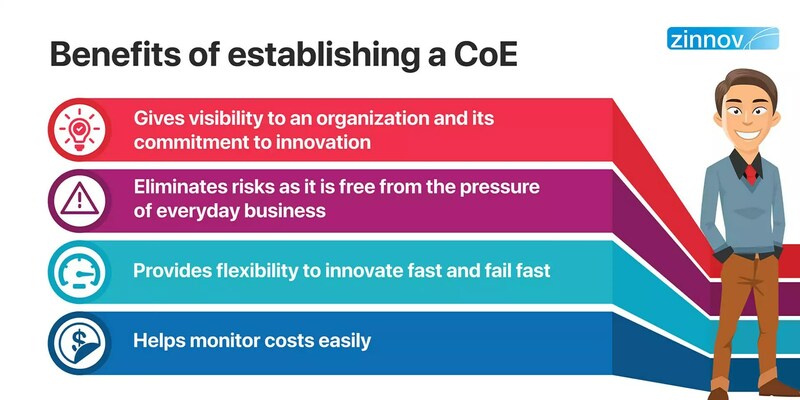 For instance, an R&D organization would define the term CoE as a dedicated team within the organization that operates with the mandate and accountability to define and implement the vision for a “specific focus” – the focus, of course, is aligned to the strategic vision of the organization. 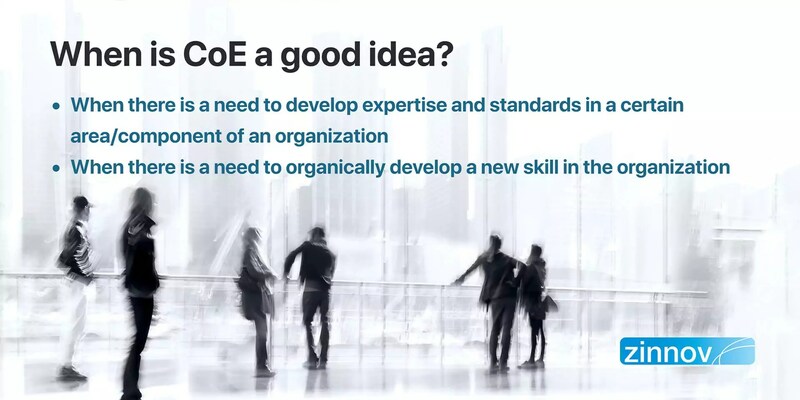 Now the question arises as to how to know if an organization needs a CoE. When is CoE a good idea? During the Second World War, the Allies sensed that the Germans were already working on new atomic weapons and Uranium. This created a sense of urgency to build the capability that could counter the German attack or even enable offense if required. This agenda led to the setting up of one of the most large-scale innovation programs that the world had ever seen – the Manhattan Project. When there is a need to develop expertise and standards in an area/component used by multiple products and solutions in the organization. The CoE, in this case, owns this competency. It defines the roadmap, standards, and the architecture for that module. Teams across the organization use the module/component in their products or solutions. When there is a need for a new skill in the organization that must be developed organically through an incubation CoE. 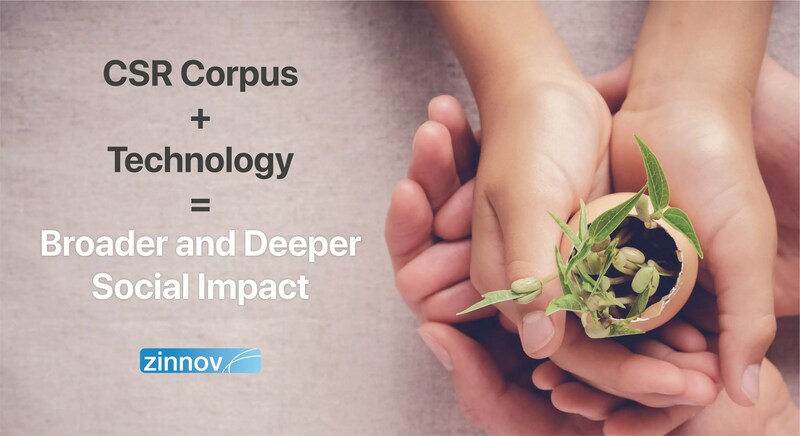 This CoE is then responsible to develop this competency through hiring, trainings, and partnerships that can be leveraged across the organization. Why set up a CoE? During the World War II, there was a time when Germans winning on every front and the fear of Hitler taking over the world was looming. At that point in time, had the Allies not taken drastic measures and invested in ground-breaking technologies such as radars, aircraft, atomic energy, etc., the world would have been starkly different from what it is today. Even in today’s world, the pace at which things are changing is incredible. The evolution of technology is unstoppable, and companies must be ready. There is an inherent need for them to differentiate themselves by providing solutions that showcase a deep understanding of domain and technology to address evolving customer expectations. What becomes extremely important for companies is to establish themselves as incubators of innovation and possess the ability to constantly innovate and fail fast. Centers of Excellence can be an effective solution to address these challenges. Establish visibility and focus: Having a dedicated team means that employees and the world are aware of the focus. CoEs also demonstrate that an organization is committed to excellence. Eliminate Risks: CoEs are not impacted by the day to day business of an organization. They do not have to deal with immediate revenue pressures and are free to channel their expertise and focus on a single business activity, process, or capability. Flexibility: CoEs are not limited by all the process overheads that typical product teams may have to deal with. They have the flexibility to innovate fast and fail fast. Monitor Costs: CoEs make it easier to control and track costs. They help organizations measure KPIs and outcomes, especially around RoI. They also help in planning and defining the focus areas for the future. 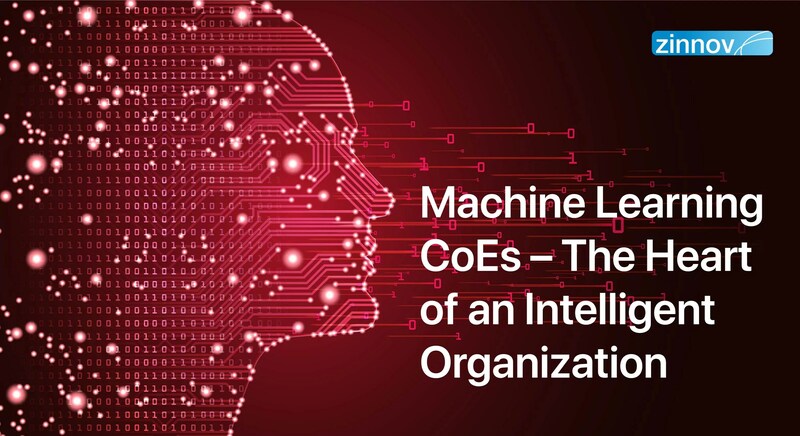 Target set up a CoE in Bangalore that focuses on Business Intelligence and Analytics, which directly contributes to enhancing the operational and sales efficiency across the organization. It helps in driving customer engagement and higher sales for the entire organization. Bosch’s analytics CoE works on predictive modeling, analytical solution design, development and architecture, data visualization for global businesses across various domains. It created a new analytical model for the automotive vertical and has developed a deep expertise in cyber-physical systems. ThyssenKrupp set up a competency center in Budapest that focuses on software development activities for electro-mechanical steering systems and develops new software functions for improved and safe driving experience. Evidently, companies are striving to win this tussle for excellence, and are leveraging CoEs as tools to stay ahead. As the saying goes, ‘Well begun is half done,’ setting up a CoE will indeed mark the beginning of an organization’s journey to excellence. However, it is only a task half done. To stand out, organizations must make sure that they have the right ingredients to establish an effective and successful CoE. Decades ago, Charles Darwin had rightly pointed out, “It is not the strongest or the most intelligent who will survive, but those who can best manage change.” Thus, change and challenges are inevitable and ready or not, expertise is the key to the future.